Land use change, including urbanization, is one of the drivers of pollinator declines, yet recent studies suggest urban areas could be good for at least some pollinator groups. In this study we mapped and sampled pollinators in four cities to assess which urban land uses are 'hotspots' for pollinators and make recommendations for better management of urban areas for pollinators. This study was a part of the Urban Pollinators Project, a four-year study whose aim was to better understand the ecology and conservation of pollinators in urban areas. 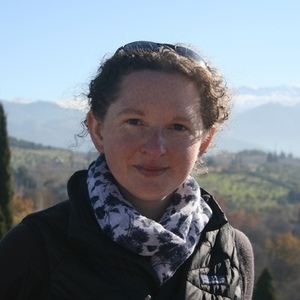 The team, led by Jane Memmott (University of Bristol), in collaboration with Bill Kunin (University of Leeds), Simon Potts (University of Reading) and Graham Stone (University of Edinburgh) set out to examine pollinators in towns and cities across the UK. The project was funded by the UK Insect Pollinators Initiative. During the project, published today in Nature Ecology and Evolution, we sampled 360 field sites in four UK cities (Bristol, Reading, Leeds and Edinburgh) over two years. Our first challenge was to locate and select our sampling sites. 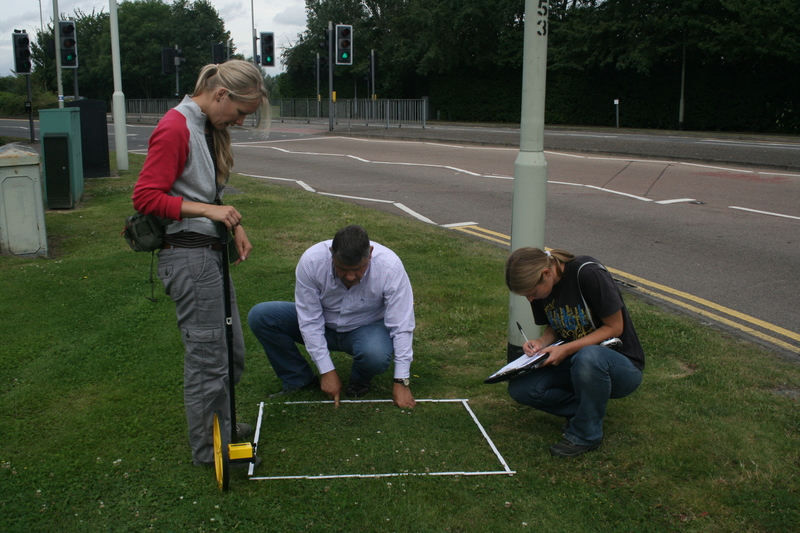 We chose to locate our sampling sites in different urban land uses, rather than ecological habitats, as the advice from our practitioner partners was that this would be most useful for working out how best to manage urban areas for pollinators. The GIS component of the research involved mapping the land uses in all four cities and was led by Anna Scott. This enabled us to calculate the area of each land use in each city and to choose sampling sites. 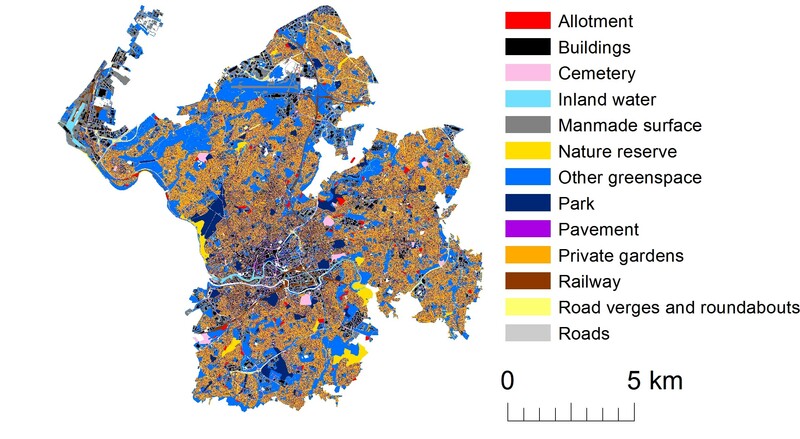 We sampled nine urban land uses: allotments (also known as community gardens), cemeteries & churchyards, residential gardens, public parks, other greenspaces (e.g. playing fields), nature reserves, road verges, pavements (sidewalks) and man-made surfaces (typically car parks or industrial estates). The remainder of the cities were either buildings, road, railways or water which contained either few or no flowers, or could not be sampled for health and safety reasons. Each city was divided into 10 regions and we randomly selected a sampling site for each land use in each region, giving 90 sites per city. The next challenge was to obtain permission to sample all of these sites. 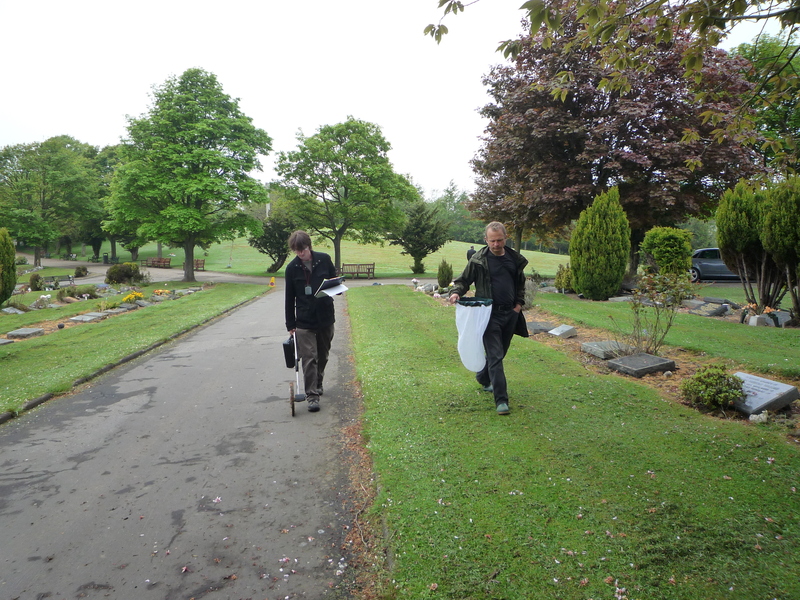 Our field teams in each city, led by Nadine Mitschunas, Lynne Osgathorpe (latterly Helen Morse), Mark Goddard and Damien Hicks, set out with maps in hand and valiantly tracked down permission to sample numerous parks, car parks, allotments and cemeteries across the four cities. We also needed 100 gardens in each city and thankfully found householders happy to provide access to their gardens, plants and pollinators. With permissions in place, the four field teams embarked upon two years of pollinator sampling. At each site we randomly located a 100 m transect (there was a 10 m transect in each garden which summed to 100 m across the ten gardens in a region). Crucially we had to ensure that all of the teams were sampling in exactly the same way, which involved detailed protocols, cross-checking of plant identification and good communication across the entire team. Along the transects we sampled all insects visiting flowers, and also sub-sampled flowers in quadrats to obtain a measure of floral abundance and diversity. 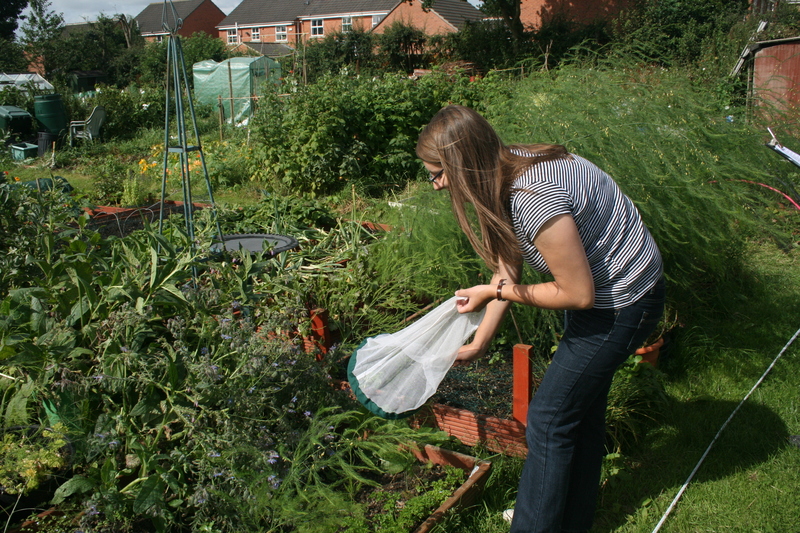 Insects were caught in the field for identification by our team of taxonomists from the National Museum of Wales. Species-level identification of the insects was key as our analyses incorporated modelling of plant-pollinator interaction networks, which show the links between plants and the insect species that are visiting them. We collected and identified nearly 5,000 flower visiting insects during the fieldwork and then the data needed to be input, checked and analysed. A key aspect of our analysis was developing a new modelling approach to test how different management strategies might affect the robustness of plant-pollinator communities in cities. Robustness is a measure of how a community responds to species loss; robust communities can withstand some extinction whereas species loss in more fragile communities leads to a cascade of other extinctions. Our model, developed by Phillip Staniczenko, used networks built from the plant-pollinator interaction data collected in the 90 sites in each city and incorporated information on pollinator dispersal and switching between forage plants. We used our model to test the city-scale effect of increasing the area of different land uses and the effect of increasing the numbers of flowers. We use our findings to make several recommendations that we hope practitioners, policymakers and the public will be able to implement, and which could help improve cities for people as well as pollinators. Firstly, increasing the area of allotments is predicted to have a beneficial effect on the robustness of plant-pollinator communities at a city scale. Allotments are recognised as beneficial for human health and well-being so increasing their area would be a win-win for pollinators and people. Secondly, while gardens are good for pollinators and comprise large areas of cities, we need to ensure that new developments contain gardens and improving the management of existing gardens with pollinators in mind could make this land use even more important for pollinators. Finally, parks, road verges and other greenspaces collectively comprise a similar area to that of gardens in cities, yet we recorded far fewer pollinator flower visits. Our models predict that increasing the numbers of flowers in these land uses, potentially through reduced mowing (which could also save money), could have a real benefit for plant-pollinator communities in urban areas. 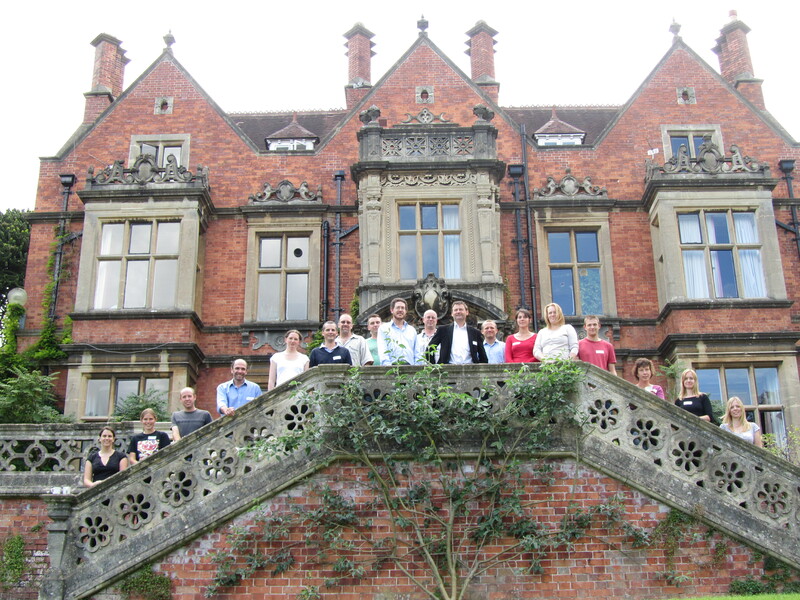 Research on this scale needs the input of many people – ecologists, practitioners, modellers and taxonomists. By working closely together in replicate cities, our hope is that we can make a real difference to the survival of urban pollinators – and by doing this there is a real chance we can improve the cities for people too.